A perfect time to get on the long and winding road to living vigorously with good health is today so start living vigorously without delay ... A healthy lifestyle involves many choices. Among them, choosing a well-balanced diet or eating plan. So how do you choose a healthy eating plan? Let us start by defining what a healthy eating plan is. Fresh fruits ― don't think just apples or bananas. These are good choices, but try some "exotic" fruits, too. How about a mango? Or a pineapple or kiwi fruit! When your favorite fresh fruits are not in season, try a frozen, canned, or dried variety of a fresh fruit you enjoy. One caution about canned fruits as they may contain added unneeded added sugars or syrups. Be sure and choose canned varieties of fruit packed in water or in their juice. Fresh vegetables ― try something new. 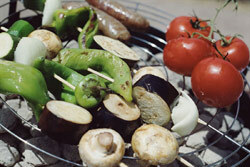 You may find that you love grilled vegetables or steamed vegetables with an herb you haven't tried like rosemary. You can sauté vegetables in a non-stick pan with a small amount of cooking spray. 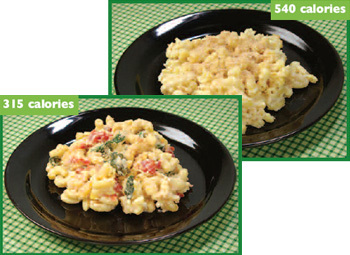 Or try frozen or canned vegetables for a quick side dish — just microwave and serve. When trying canned vegetables, look for vegetables without added salt, butter, or cream sauces. Commit to going to the produce department and trying a new vegetable each week. Calcium-rich foods ― you may automatically think of a glass of low-fat or fat-free milk when someone says "eat more dairy products." But what about low-fat and fat-free yogurts without added sugars? These come in a wide variety of flavors and can be a great dessert substitute for those with a sweet tooth. A new twist on an old favorite ― if your favorite recipe calls for fried fish or breaded chicken, try healthier variations using baking or grilling. Maybe even try a recipe that uses dry beans in place of higher-fat meats. Ask around or search the internet and magazines for recipes with fewer calories ― you might be surprised to find you have a new favorite dish! Do you have to give up Favorite Comfort Foods? Consume them less often. If you normally eat these foods every day, cut back to once a week or once a month. You'll be cutting your calories because you're not having the food as often. Being consistently healthy in your eating choices is the key. Making the same healthy eating choices over time can lead to better eating habits. By thinking more positively and focusing on what you can have, you'll help yourself establish healthy eating habits. Have you tried to lose weight by cutting down the amount of food you eat? Do you still feel hungry and not satisfied after eating? Or have you avoided trying to lose weight because you're afraid of feeling hungry all the time? If so, you are not alone. Many people throw in the towel on weight loss because they feel deprived and hungry when they eat less. But there is another way. Aim for a slow, steady weight loss by decreasing calorie intake while maintaining an adequate nutrient intake and increasing physical activity. You can cut calories without eating less nutritious food. The key is to eat foods that will fill you up without eating a large amount of calories. If I cut calories, won't I be hungry? Research shows that people get full by the amount of food they eat, not the number of calories they take in. You can cut calories in your favorite foods by lowering the amount of fat and or increasing the amount of fiber-rich ingredients, such as vegetables or fruit. Let's take macaroni and cheese as an example. The original recipe uses whole milk, butter, and full-fat cheese. 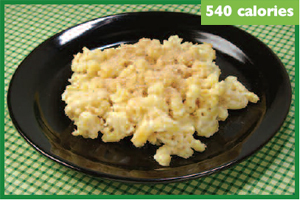 This recipe has about 540 calories in one serving (1 cup). Use 2 cups non-fat milk instead of 2 cups whole milk. Use 8 ounces light cream cheese instead of 21⁄4 cups full-fat cheddar cheese. 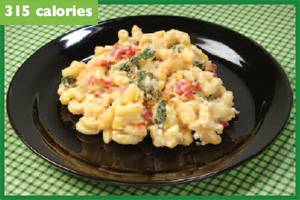 Use 1 tablespoon butter instead of 2 or use 2 tablespoons of soft trans-fat free margarine. Add about 2 cups of fresh spinach and 1 cup diced tomatoes (or any other veggie you like). Stays within your calorie needs. The number of calories in a particular amount or weight of food is called "calorie density" or "energy density." Low-calorie-dense foods are ones that don't pack a lot of calories into each bite. Foods that have a lot of water or fiber and little fat are usually low in calorie density. They will help you feel full without an unnecessary amount of calories. Good things can come in big packages! People eat more than they realize when faced with large portion sizes. This usually means eating too many calories. But, not all large portions are created equal. Larger portions of water- and fiber-rich foods, like fruits, vegetables, and broth-based soups, can fill you up with less calories. Start with an appetizer. Research shows that if you eat a low-calorie appetizer before a meal, you will eat fewer total calories during the meal. Start your meals with a broth-based soup or a green salad without a large amount of cheese, or croutons. Fruits and veggies: keep it simple! Most fruits and veggies are low-calorie and will fill you up, but the way you prepare them can change that. Breading and frying, and using high-fat creams or butter with vegetables and fruit will add extra calories. Try steaming vegetables and using spices and low-fat sauces for flavor. And enjoy the natural sweetness of raw fruit. While drinking beverages it's important for good health, to know they don't help you feel full and satisfies the way food does. Choose drinks without calories, like water, sparkling water, or unsweetened iced tea. Drink fat-free or low-fat milk instead of 2% or whole milk.